Place sugar and 2 cups cold water in a saucepan over low heat. Stir for 4 to 5 minutes or until sugar dissolves. Increase heat to medium. Bring to the boil. Remove from heat. Sprinkle over gelatine. Stir with a fork until gelatine has dissolved. Combine milk and almond essence in a bowl. Add sugar mixture, stirring, in a slow steady stream. Pour into a 3cm-deep, 20cm x 30cm lamington pan. Cover. Refrigerate for 4 hours or until set. Combine lychees, melons and reserved syrup in a bowl. Run a palette knife around edge of pan. Invert pan onto a chopping board. Press base of pan to release jelly. Cut jelly into squares. 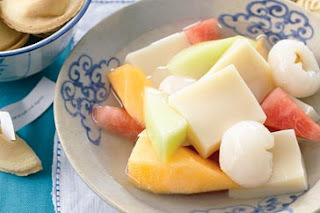 Serve jelly with lychee and melon salad.